Electrical enclosures are rated and differentiated according to their quality and efficiency to withstand and protect electronic equipment from harsh environmental elements such as ice formation – this also includes ingress of water & dust. The National Electrical Manufacturers Association in the United States has established NEMA ratings to help the manufacturers and companies that use electronic enclosures to classify the degree of protective enclosures can have. Likewise, Europe has established the IP ratings which stands for Ingress Protection developed by the International Electrotechnical Commission (IEC.) Like NEMA ratings, IP ratings also give classification on what type of protection electrical enclosures are designed for. The IP rating format is followed by a number and in some occasions, a letter. The first numeral indicates the level of protection from solid intrusion or ingress, and the second number indicates the level of protection from liquid ingress. The level of protection can be determined by the value of the number – the higher the number is, the greater the level of protection it can give. For example, an enclosure with an IP rating of 10 has a lower level of protection compared to IP54. NEMACO manufactures both electric enclosures with NEMA & IP ratings. Both NEMA and IP ratings classify protection provided by electrical enclosures from solid & water ingress. Unlike IP ratings, NEMA also gives classification for other protective qualities of enclosures such as corrosion and it also specifies how the enclosure is made. 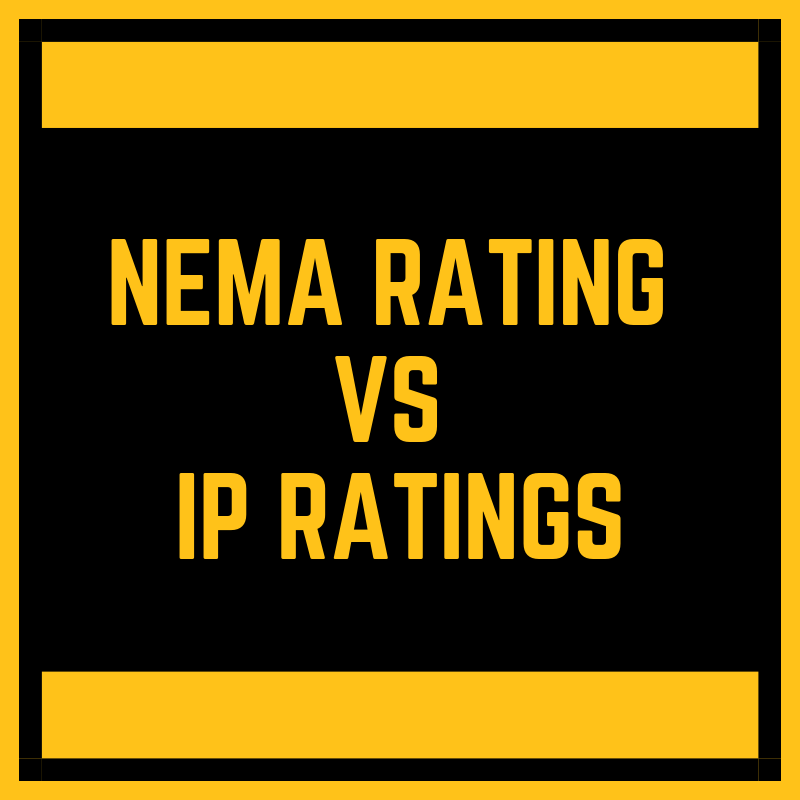 One can say that NEMA ratings can be translated into an IP rating, but IP rating cannot be always translated to a NEMA rating because it will not have the same equivalence. It is important to note that when comparing the two ratings, you can only get an approximate level of protection. The responsibility of specifying the use of electronic enclosures should be shouldered by the user because there is no one standard enclosure for different types of application. IP54 – it has limited dust-tight protection and it protects equipment from water spray in any direction. IP65 – this enclosure is dust tight and it gives protection from water sprayed from a nozzle. IP67 -this enclosure is dust tight and can be submerged in water between 15cm and 1 meter in water depth. IP68 – this enclosure is dust tight and can be totally submerged in water. NEMA 1 is generally intended for the majority of indoor use or application, it gives a level of protection from solid ingress and it gives protection for electrical enclosures from contact coming from personnel using it. NEMA 2 is designed to give protection for equipment used in indoor applications, it is primarily intended to give protection from water dripping and dust ingress. NEMA 3 enclosures are intended to be used for any indoor & outdoor application that requires protection on equipment from dust & water ingress, and sleet and ice formation. These enclosures will be undamaged even with the presence of ice formation. NEMA 3R are generally used for outdoor purposes, this gives protection for equipment from rainwater and ice formation on the enclosure. These are the enclosures built for both indoor and outdoor use. NEMA 4 provides a level of protection for enclosures from having incidental contact with the equipment housed inside the enclosure. It also provides protection for the electronic equipment against dirt, rain, sleet, snow, dust, splashing & hose-directed water from all angles. Rest assured that this enclosure will be undamaged if there is an ice formation present. Generally designed for both indoor and outdoor protection – it gives protection from dust ingress and is provided by gaskets. NEMA 6 is designed for indoor & outdoor use for applications that present the need for temporary submersion of an enclosure in the water at a limited depth. The enclosure will be remained undamaged if there is an ice formation present. NEMA 7 enclosures are intended for indoor use for locations classified as Class I, Groups A, B, C, or D, in the National Electrical Code. These enclosures are capable of resisting the pressures coming from an internal explosion of categorized & specified gases that can result in the explosion. There will be no ignition that will happen outside the enclosure from the gas-air mixture surrounding the enclosure. Enclosed devices that are heat-generating will not make the external surfaces of the enclosure reach to a certain point where there will be an increase in temperature that will result in igniting the gas-air mixtures surrounding the atmosphere. With this in mind, NEMA 7 should pass the explosion, hydrostatic, and temperature design tests. NEMA 9 enclosures are for applications in special-purpose indoor use where it is used in hazardous locations (Class II, Groups E, F, and G) as classified in the National Electric Code. This enclosure is also capable of preventing dust ingress. There will be no ignition that will happen outside the enclosure from the dust-air mixture in the surrounding atmosphere and there will be no discolouring of the dust in the enclosure. NEMA 9 enclosures should pass the penetration and temperature design tests. These enclosures are made to prevent incidents stemming from close contact of personnel to the enclosed equipment – these are manufactured without knockouts. Generally intended for industrial indoor use, and these enclosures are generally made to protect the equipment from dust ingress, falling dirt or dripping non-corrosive fluids. Generally manufactured and designed for indoor industrial use. NEMA 13 are used to give a level of protection from dust ingress, liquid ingresses such as water sprays, oil, and non-corrosive coolant. Next Next post: Electrical Enclosures: What is NEMA 4?